The BIG LUMEN Lighting Co., creator of the award-winning Foreverlamp™ LED Retrofit Lamp Series, announced that its HB™ Series High-Bay LED fixtures have been added to the DesignLights™ Consortium (DLC) Qualified Products List (QPL). As an innovator and leader in high power, high lumen lighting, the HB Series High-Bay, combined with the Foreverlamp LED replacement lamps, have been approved by DLC in the Replacement Lamps for High-Bay Luminaires (Type C) category. The BIG LUMEN Lighting Co. DLC Approved LED HB Series™ high-bay fixture was designed specifically to replace a 400W HID fixture delivering value, performance, and over 50% savings on energy costs compared to MH and HPS systems. By utilizing the latest advancements in solid state technology and product innovation, the BIG LUMEN Lighting Co. designed an energy efficient, lightweight, yet powerful “Big Lumen” high-bay. The HB Series™ fixture is available with a choice of lumen packages from 18,000 to 27,000 lumens and comes with a high-efficiency dimming LED driver. 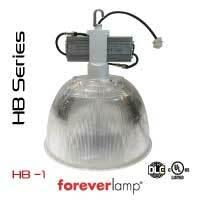 In addition to being DLC approved, the HB Series™ fixtures are also UL and CE listed. Foreverlamp’s award-winning products from The BIG LUMEN Lighting Co.™ have been installed in commercial applications from big box retail, warehouses, studios, sports centers, aerospace, convention centers and more across the US and Europe for over 6 years since the companies launch in 2010. As a market leader in high power, high lumen lighting, Foreverlamp™ replacement lamps have been installed in over 100 sites that retrofitted more than 500 fixtures per site. No other manufacturer of LED Replacement lamps can come close to this claim. Compact / Lightweight – 12 lbs. For additional information, visit www.Foreverlamp.com.